One Kalamazoo brewery owner thinks he can circumvent Michigan cannabis consumption law by turning his bar into a private cannabis club after hours. Although marijuana is now legal for recreational use in 10 states — in many places regulated “similar to alcohol” — cannabis consumers in those jurisdictions still do not have the same freedoms as many social drinkers enjoy on a regular basis. Aside from a few minor exceptions, the concept of the cannabis lounge continues to struggle to gain any traction in the United States. The introduction of weed into the crevasses of civil society is still too new for the powers that be to give the people the same kinds of consideration that it does for everything alcohol. Some of them believe that unleashing this idea into the public will only serve to drive the country in the mouth of madness and contribute to crushing levels of stoned driving, reckless homicide and other menaces to the streets. But in Michigan, a state that went fully legal last November, cannabis consumers are getting some support from local brewers. Kalamazoo brewery owner Mark Rupert told MLive that he plans to turn his beer-slinging operation (Rupert’s Brew House) into a part-time cannabis lounge as a means for giving pot-forward individuals the opportunity to socialize with their people. Rupert will hold private events — hosting gatherings after his business is closed — to avoid trouble with the law. These soirees will be BYOW (bring your own weed) and Rupert will not be selling cannabis products of any kind. A modest membership fee of somewhere between $5 and $20 will also apply. The collected dues will be used to pay for key fob access to regular events. “There are not a lot of places that are welcoming to the new idea of cannabis being recreational,” he told the news source. 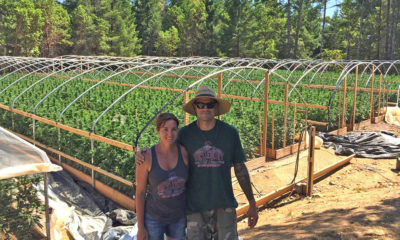 “I think it’s important for the community to have a place where they can feel comfortable talking about cultivation or the culture of cannabis on top of everything we already do with the craft beer,” he said. Unfortunately, there could be some trials and tribulations with launching a social cannabis use scene — even if it is through private events at local businesses. Michigan Department of Licensing and Regulatory Affairs Spokesman David Harns says that Rupert might be in violation of the terms of his license by opening his doors in this manner. “A brewery may not act as a private club unless they surrender their liquor license to the Commission or put it into escrow,” Harns explained. Considering that the state’s marijuana law doesn’t allow cannabis consumption at any place of business, Rupert could face fines or even a suspension of his license by moonlighting as a private club. But the thing is social marijuana use is not something that Michigan lawmakers have hashed out. This one of those grey areas that allows a shadow cannabis industry to have a certain level of free rein. Still the key to maintaining a legitimate social club, according to Kalamazoo-based attorney Sarissa Montague, is making sure to establish a private space for pot-friendly events. It has to be private. This is not to say that social clubs will not experience their fair share of hassles — they probably will — but falling in line with the current standards for these types of private clubs may keep the train on the tracks until a more definitive law is put on the books. Similar members-only clubs have opened up in other legal states, but many have been shut down or raided by law enforcement. This has happened quite a bit in parts of Colorado, one of the first states to legalize for recreational use. Police there have used a variety of slip-ups (advertisements, selling food and beverages) to build a case for why these establishments are not operating as private. Regardless of the possible snags, Rupert’s inaugural event seems to have been a success. Some reports show it attracted somewhere around 100 people. And even though city officials did come in to check the place out, there were no issues and the event was allowed to carry on as planned. “We’ve had the health department OK us, give us permission, written permission. Even the Kalamazoo Police Department came in and said, ‘Well, we just wanted to check in on how things are going and it looks private,'” Rupert told WWMT. Rupert’s Brew House is planning more social marijuana use events. The next one is set for January 19 at 10 pm. TELL US, do you think states should allow cannabis consumption lounges?